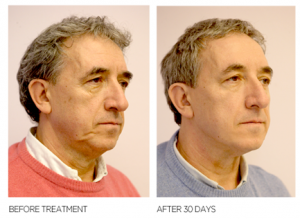 Are you suffering from early signs of jowls and skin laxity, but don’t want to commit to a full surgical facelift? 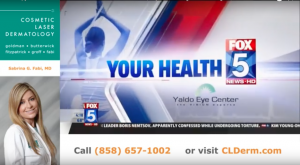 Cosmetic Laser Dermatology has a solution for you. We are one of the very first practices in the United States to offer the recently FDA approved Silhouette InstaLift, a non-invasive, non-surgical facelift that takes only 45 minutes to perform and reveals instant, long-lasting results that only improve over time. All five of our expert doctors are trained in this procedure, and we are excited to offer it to our patients who want comprehensive lift and rejuvenation without the anesthesia, incisions, scarring, and recovery time of full surgery. 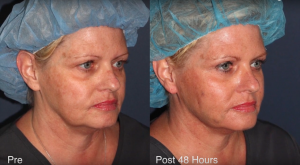 Silhouette InstaLift is a non-invasive alternative to a traditional surgical facelift. It helps to address volume loss as well as skin laxity through not only instant lift of the skin but also long-term collagen production. Specially formulated dissolvable sutures with bidirectional cones are used to mechanically fix deep tissue until collagen production ensures tissue fixation biologically. The entire procedure takes only 45 minutes and requires no incisions or anesthesia. Instead, lidocaine is injected locally to ensure patient comfort during the treatment. While cosmetic dermatologists have performed thread lifts previously, InstaLift provides a vast improvement thanks to the use of dissolvable threads and cones made up of a synthetic material called polylactic acid, which is also used in Sculptra. This material slowly disintegrates as the body creates scar tissues, which provides a natural lift for the face in their place. Through the use of bidirectional cones, the lifting caused by InstaLift can be more finely controlled. Combined, these advantages result in the long-lasting effects of InstaLift while avoiding the potential side effects once felt by patients who chose previous versions of thread lifting. Silhouette InstaLift’s double action of lift and regeneration helps smooth the skin and contour the face, allowing you to look your absolute best. First, the tissue is lifted from within by the sutures, providing instant lift and contour. Next, the sutures stimulate collagen production, allowing for a regenerative effect that means the skin will continue to look better, firmer, plumper, and more youthful over time. ncbi.nlm.nih.gov also explains the skin rejuvenation process. 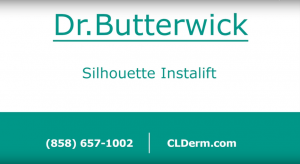 The Silhouette Lift is the facelift that keeps on working long past the initial treatment! During a traditional surgical facelift, volume loss is not addressed. A facelift ONLY tightens the skin, thus reducing jowls and drooping but not addressing underlying volume loss. Before InstaLift, at least two procedures would have been necessary to address both of these concerns, whether a surgical facelift plus fillers or a non-surgical skin tightening procedure plus fillers. Now, however, skin tightening and volume restoration can both be addressed in the same quick procedure with minimal downtime! These are by no means a guarantee that you will not bruise, but they will help to minimize your chances of severe bruising. If you do bruise following the procedure, it can be easily managed with arnica and over the counter medication and can be covered with makeup. Redness can also be covered with makeup. Swelling can be managed by keeping the head elevated at all times, including when sleeping, and by icing the affected area regularly. Read our pre/post treatment guidelines for Silhouette InstaLift.